In a sad turn of events, filmmaker Colonel Raj Kapoor passed away a 87 on Wednesday night. He was most known as the director of the TV serial, Fauji. He had introduced Shah Rukh Khan for the first time through the soap. 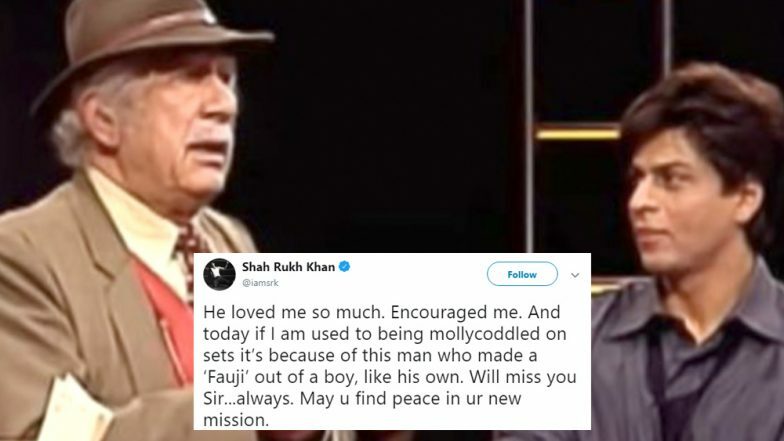 SRK took Twitter to express his condolence. He became nostalgic as it was him who gave a major break to the superstar in the first place. Shah Rukh Khan to Attend Beijing International Film Festival 2019: These Are The Topics Which Zero Actor Will Speak Upon. In the tweet, he wrote, "He loved me so much. Encouraged me. And today if I am used to being mollycoddled on sets it’s because of this man who made a ‘Fauji’ out of a boy, like his own. Will miss you Sir...always. May u find peace in ur new mission." Colonel's daughter Ritambhara informed about this sad news to the media. She revealed that his left for the heavenly abode at 10.10 pm due to age related issues. She also pointed out that he was in a good health and passed away quite peacefully. As we all know, Fauji has been a major stepping stone for King Khan that actually further allowed him to be a superstar. The late director is often credited to the massive success that Badshah of Bollywood has garnered. However, In Samar Khan's book titled SRK - 25 Years Of A Life, he wrote in an essay, "I've been an actor, I've fought three wars, but all that anybody seems to remember is that I launched Shah Rukh 20 years ago. It amuses me to think that I'm given credit for something I played no part in. Shah Rukh's parents made him, I didn't. I didn't make a superstar." We're sure that these words must have touched the heart of Shah Rukh Khan himself as well.